Now you can speed up your digital workflow with Fast Picture Viewer. 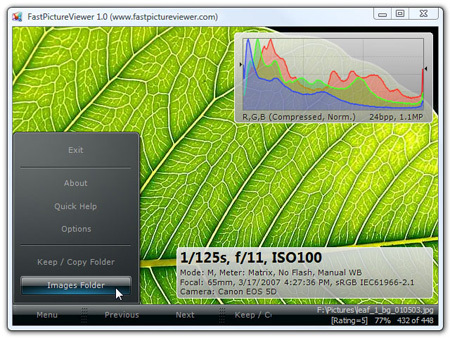 Fast Picture Viewer is a minimalist 32 and 64-bit image viewer for previewing and rating digital images faster then ever before by taking advantage, when available, of the power of multicore processors and the speed of DirectX graphic accelerators, all working together to speed up photo viewing to unprecedented levels.This is the effective digital image viewing utility with the advantages of smooth and fast image viewing technology. With the help of this fast, compact and free image viewing tool one can view images quickly and easily in an easy to use interface. Instant flip to the next image. Instant switch between fit-to-window and 100% mode view. Three-channels high-precision R,G,B histogram display. Click-and-hold instant zoom and configurable 50%-6400% magnifier. Single-click background copy of your “keepers” to a preset folder. Adobe XMP sidecar file creation/update, instantly rate and categorize pictures. Seamless multiple-subfolders browsing, in one single continuous sequence. Drag and drop support, drop a folder or a set of image files to quickly view them. Easy browsing over of tens of thousands (yes!) of images in deeply nested sub-folders. Plug’n’play integration with optional automatic browsing of inserted media or digicam. Instant automatic detection of new images added to the folder tree, while you browse. FastPictureViewer is among the firsts of a new breed of hardware accelerated desktop applications and delivers unprecedented speed and ease of use. Next: Send Large Files Directly between Browsers using Files over Miles.